Radial has just been picked by Verizon’s MusicaUnsigned contest as one of the top 5 bands, come see them on Thursday May 23rd and see what all the talk is about. This line up has some incredible singer/songwriters with and fabulous taste for lyrics and music. See for yourself. Radial es una banda independiente de indie rock, formada en Puerto Rico en el 2005. Luego de grabar su primer disco “Prueba a Ver” (Nashville, TN) a finales de ese mismo año, comenzaron a tocar en vivo, y a darse a conocer en la isla a través de una gira colegial y universitaria. Buscando oportunidades en un mercado internacional, la agrupación decidió mudarse a Los Ángeles, California en el 2012. Alguno de los momentos que se destacan en esta nueva etapa son, entrar a la programación de MTV3 y presentarse en importantes venues de la ciudad de Los Angeles. En el 2013 la banda realizó su primera gira en México, presentándose en el Distrito Federal, Tijuana, Tepic, Mexicali y Guadalajara. Ecuadorian singer, guitarist and composer, born in Quito on March 26, 1981. She started experimenting with singing and with guitar playing during childhood. Joanne Vance got her B.A. in music and Hispanic literature at the University of Michigan in Ann Arbor, where she started writing her first songs. Since then, she has had the opportunity to play them in Ann Arbor, San Francisco, Toronto, Santiago de Chile, and in Quito. Joanne Vance´s music mixes vibrant and descriptive lyrics with textured sonority and suggestive harmony. Her sound blends pop, rock, jazz and blues providing a unique alternative fusion with lyrics that explore themes such as journeys, love, reflections on humanity and society in general. With a strong influence from artists such as Jeff Buckley, Ani Difranco, Tori Amos, Fiona Apple, Luis Alberto Spinetta and Pedro Aznar, Joanne Vance opens up an intimate space of sensations that interweave strength and subtleness. Andrea (Andie) Sandoval, born and raised in Culiacan, SIN, Mexico, started singing at the age of 6 performing some more traditional genres of the Mexican culture. She’s a Pop/Rock singer/songwriter that has been described as “Kelly Clarkson meets Taylor Swift, Aretha Franklin and Adele”. What sets her apart from everyone else are her outstanding strong and soulful vocals along with her true and heart felt lyrics and melodies. In 2012, she moved to Hollywood, CA to start an Associate Degree in Vocal Performance with an emphasis in Independent Artist at Musicians Institute (graduated in spring 2014) . She was the winner of “Artist Development: The Show” at Musicians Institute performing 3 of her originals including “You’re On Your Own”, “Trouble Magnet” and “Wake Up, Break Up”. In June of 2014 she submitted “Trouble Magnet” at the Indi.com Original song Challenge, winning as the Judge’s Pick with the Grammy Award winning Producer John Shanks as the Judge. Andie is currently working on her solo project as an independent artist with side projects in Collaboration with various musicians/songwriters/producers. “Gold In The Sand” is the name of her first single now available on iTunes. Meli Malavasi is a Costa Rican performer, producer, singer/songwriter, dancer. She currently resides in L.A, CA. At a young age Meli began demonstrating a passion for music by playing piano. Later on, she incorporates singing and guitar to her life. Thanks to this song Meli was a finalist in the “International Songwriting Competition” beating over 20,000 people, and won “Best Female Dance Artist” at the Indie Music Channel Awards. She also got a recent nomination for “Techno/Electronic” artist at the HMMA awards 2013 in Hollywood,CA by Emmy & Grammy award winners committee. She’s currently on tour in Costa Rica and the United States, catch Meli get to know and dance with her! 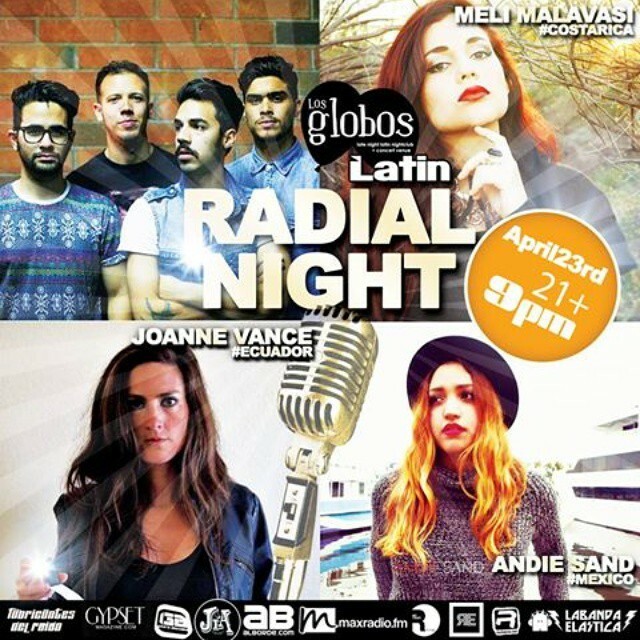 Courtesy tickets for this show go to https://www.eventbrite.com/e/radial-joanne-vance-andie-sandoval-meli-malavasi-showcase-at-los-globos-tickets-16508268676?ref=estw while supply last!